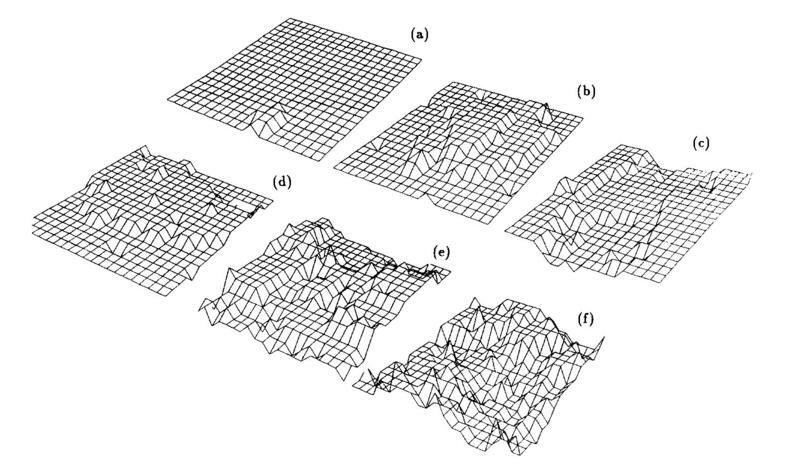 Some numerical studies of roughening made with SOS (Solid-On-Solid) models, some as interfaces in Ising models. Some by simulation some by series expansions. The SOS models were also applied to telescope phasing, not discussed further here. I became involved in the numerical side of roughening, during a sabbatical in Seattle, where I took over supervising a friend's project student, E. Arian. On my return, Steve Lipson suggested continuing this direction, to connect with his experimental work. 3 students, Gidi Baum, Sasha Gemintern and then Adham Hashibon worked with us. Simulations along the facets requires attention to boundary conditions and equilibration. Thruout these projects we searched for ways to visualize the crystal surfaces. The first is shown at left, TOPDRAW in Seattle. The rest will be covered in the following slides.